This hotel is in a wonderful location, food adequate but can be a bit repetitive after two weeks, Lots of Pork! But you can always find something to fill you up. I would say this hotel is a 3 star. I do not think the hotel suitable for children, many of guests are over 70 and have been there time and time again, and are always telling you so! Problem is many of these elderly people push and shove their way around the restaurant and some of the guests hygiene leaves a lot to be desired, tasting the soup from the ladle then returning it into the soup. Not using the hand sanitizer which is provided outside the restaurant entrance, many of them are so eager to get into the restaurant and make long queues to get in there at 7.00 pm - Sergio the Restaurant Manager is excellent and very welcoming. Some of the entertainment was not for us, eg Name that Tune and Music Quizzes, but the acts we did see where quite good. As I say the location is the main reason we returned to this hotel. This hotel may suit you better if you are over 70. The Thomson Rep Victor was one of the best Thomson Reps we have ever met. He is a sweetheart!! 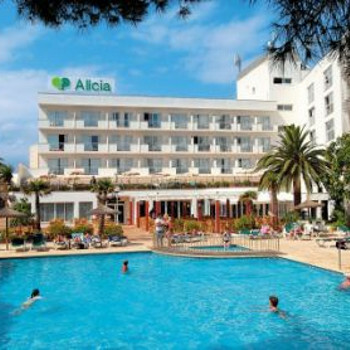 Stayed at Alicia 13th to 23rd September 2011, very nice but no way should it be platinum next year. There is no beach in front of hotel, bedrooms are in need of refurbishment, entertainment is very poor. Loved the Alicia. Very clean and bright with a great relaxing pool scene. Plenty kids due to it being the summer hols, but not overrun with them. My child 9 made plenty of friends. The entertainment is good when there is a proff show on although these finished to early 11-o-clock after this there is nothing we kept asking for some music but this was so quit you could hardly here it. The location is brill had room on 4th floor with views to die for, room very big for a family room/ 3 beds Dad had a single room overlooking pool and loved it. Always found something to eat allbeit a bit english for my liking, could do with a kids section in school holidays although always found my bo something to eat. We knew when we booked this hotel that the location was good, but when we arrived at our room we were amazed just how good!!! The size of the room was huge with lots of plug sockets, the balcony was so big you could have had a party on it. Rooms wre cleaned every day to a high standard, the food was excellent...my only complaint would be that the tables are very close together and therfore we found ourselves bumping into people and chairs etc etc. Location, well, open the patio door to the balcony and the beach stares you in the face. (only a small beach but a bigger one just a short distance up the road) reception staff and maids were friendly and the restaurant manager was lovely. Bar staff not so although we didnt spend a great deal of time in the bar, wich leads me to the entertainment, didnt see much but must say that there was somrthing for everyone no matter what age! Would we visit this hotel again? YES when we are OAP,s as that was the only down side to it. Its FULL OF THEM! Nothing wrong with that of course but as we are only late 40,s early 50,s there wasnt anyone our age to talk to. Would recommend this hotel to anyone . This hotel was lovely. The staff couldn't have been more helpful especially the reception. They could answer all our questions about local buses nearby resorts etc. The hotel was throughly cleaned daily and the pool area washed down daily. The food was fantastic. I couldn't think of anythink else they could have provided for breakfast; continental, full English, cheff making omlettes and pancakes, fresh fruit, dried fruit, toast and the list oges on. ~The evening meal was just as good. The evening entertainment was very good. My husband and I don't usually stay in the hotel for the entertainment but we found ourselves witching alot of it. This is one of the best places I have ever stayed at. The main entertainment area was no smoking which was nice. There was so much food you could make yourself ill.Again no smoking. The location was perfect. We were in room 429 with a sea view that was just outside the window. Perfect. We were told the best room of the 5 floor hotel were the number from 1-18 they had more sun for longer. There are other rooms with more sun but they don't have the sea view. The rooms have hot and cold air conditioning. There is the most wonderfully warm indoor pool and jacuzzi. It was to cold in the outdoor pool but I'm sure it would be great in the summer months. The staff were so lovely and helpful. The evening entertainment was O.K , because it was the start of the season every thing was just starting and it wasn't in full swing. But there were other places to go for evening entertainment we visited the Bonaire and the Lavante both within a short walk. It was flat ideal for Pushchair / wheelchairs. Would I go again Yes without a doubt. I thought hotel Alicia was fantastic. The entertainment was brilliant every night,the people were really friendly and helpful. Overall I thought it was that good im coming back again in the middle of September 2007. Im looking forward to coming back. We stayed at the Hotel Alicia in August 2006 for the first time. The room we had on the ground floor was lovely with a fantastic view out to sea. The food in the dining room could not be faulted; there was plenty of choice both at breakfast and at dinner, although towards the end of each dining period the staff were eager to clear everything away quickly and switch off the buffet counters. It was also difficult on occasions to get a drink to go with dinner. Generally the hotel was very good and we would go back, however the one drawback was the entertainment which was terrible. During the daytime there were a few activities arranged for the children, such as water polo, but not much interest or enthusiasm from the entertainers. The evening entertainment was the worst. Apart from an OK comedian one evening the rest of the week was abysmal with bingo sadly being the highlight! One evening there was actually a "game show" run by the entertainment team with items such as "the ballon between the legs" and "fetching items from the audience" - these weren't funny 20 years ago -and surely more up to date entertainment could be provided? The entertainment team kept making reference to there only being 6 people watching - not surprising really. Apart from this, the hotel is in a superb location between Cala Bon & Cala Millor and is well worth a visit - just go out in the evenings when the "entertainment" is on! We stayed in the Alicia Hotel, Cala Bona for 7 nights at the beginning of August 06. We had booked after reading reviews on this site and after having to cancel a previously booked hotel due to dreadful reviews. We were not sorry. The Alicia was lovely. From the moment we arrived we were made welcome and the staff could not do enough to help. Marc on reception even changed our gala dinner night when we mixed the date up and missed our original booking (we hadn't even expected the dinner which was fabulous, pleased we didn't miss it!). The hotel is spotlessly clean and very well kept. We had a family room on the 5th floor - the view was spectacular, uninterrupted view straight out to sea. It was lovely on a night when the moon shone over the bay. The dining room was kept immaculate with a good variety of food each night. There was always something for everyone including my very fussy daughter. Pancakes, omelettes etc made to order for breakfast if you wanted plus all the usual cereals, cooked items etc etc. Evening meals: wide choice of main courses, including carvery plus all the usual starters, veg, soups etc. Desserts were to die for! Pool area kept very nice but we would agree with previous reviews regarding the entertainment - this is the only thing that, we felt, let the hotel down despite Gemma's (animation team member who always seemed to be on duty) best efforts. We went out most nights but did see one or two shows - Abba were good but the magical musical night was less so! We found the beach in Cala Millor nicer, warmer and less rocky than the beach in Cala Bona and its only 5-10 mins walk from the hotel. We would certainly visit The Alicia again - already thinking about next year. I and my wife arrived at this hotel in Aug 06 on an allocation on arrival deal. On arrival we didn't know what to expect, the staff was very friendly and the reception very clean. As we entered our allocated room it was in darkness, we opened the curtains to a fantastic view of the sea, at that point we knew we it the jackpot. The hotel was spotless, the food was great, and overall the holiday was great. The only down side was the entertainment and Portland holiday need to sit down and seriously look at the standard of the entertainment it was appalling but the rest of the holiday more than made up for it. 6 days into the holiday we rebooked it for two weeks in Aug 2007 (It really is that good). Don't let the entertainment bit put you off you will love the place and you will more than likely rebook it again.